Since its opening, an unusual cluster of five box-shaped buildings of different heights conceived by the Vietnamese firm Vo Trong Nghia Architects has been a wondrous sight for lovers of architecture. 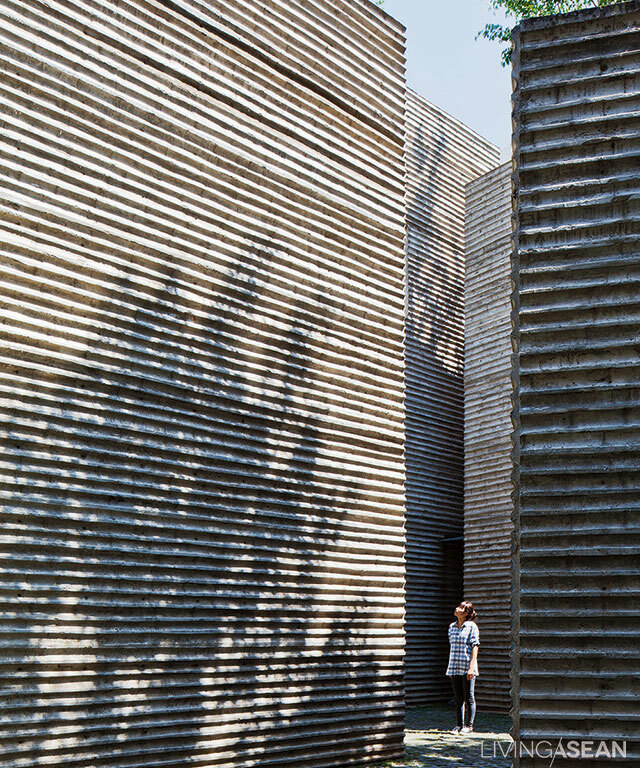 The varying heights enable residents to view nature from various angles. On a roof it is easier to water the trees planted up so high. 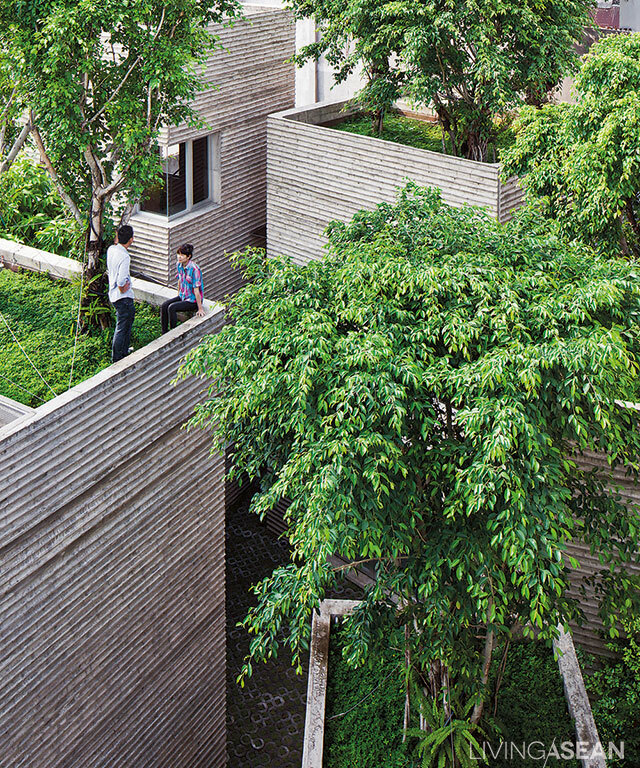 These buildings are actually tree planter boxes set up to make a house for a small family. 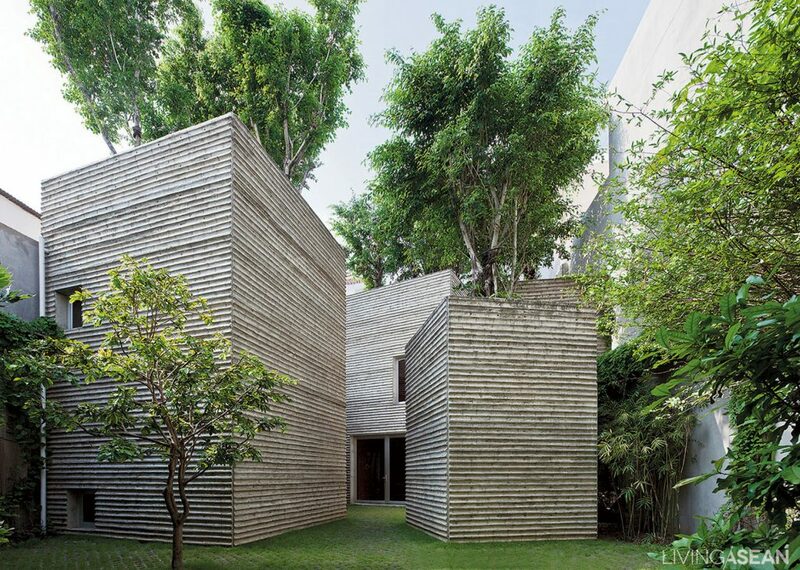 Besides catching the attention of passersby with trees popping up from rooftops, this clever design also won numerous awards in 2014, including the Ashui Award and a world-class award from Architectural Review. The land was once used for a factory. Though the factory was demolished, it remains close to the hearts of the owners/family members, which is why they wanted to build the house here. 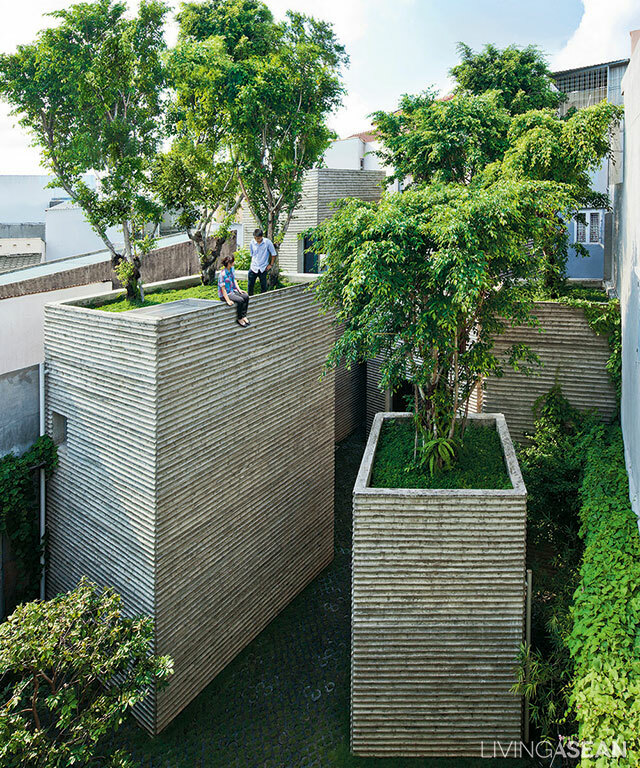 Due to environmental limitations such as a small alleyway for an entrance, an asymmetrical plot, and a lack of greenery, the owners decided to create a courtyard surrounded with gigantic plant containers. In this way family members, and even nearby neighbors, can live close to nature. To go between rooms, you need to first step outdoors. 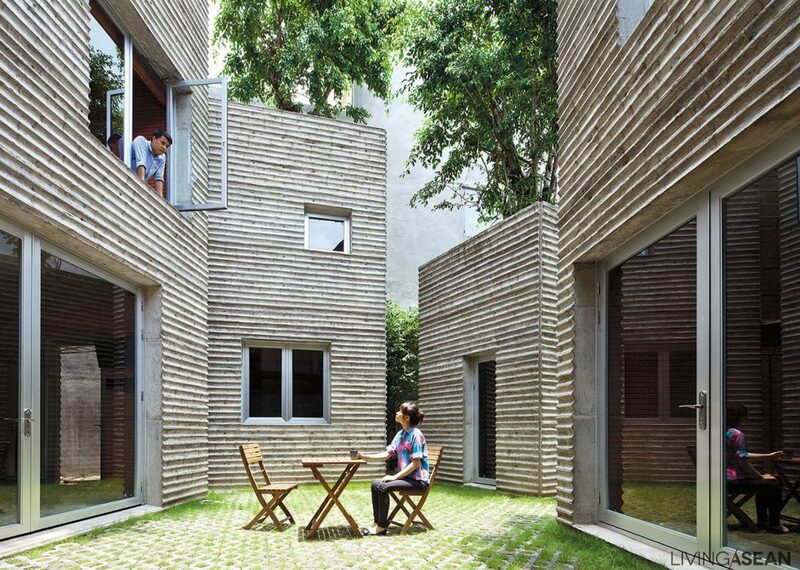 This is the architect’s concept: bring people a step closer to nature so they directly interact with the environment. Another impetus for the unique design involves the owners’ 50-year-old father. To provide some relief for his depressive disorder, the designer team divided the house interior into five sections. To move from one room to another, the father and other family members have to walk outside. Lush trees, gentle breeze, birdsong, and friendly neighbors can be good mental therapy. Each house section can be seen from inside another part of the“box house.” This encourages a novel pattern of communication which maintains privacy for both people inside and out. Walls are the primary features of each building. 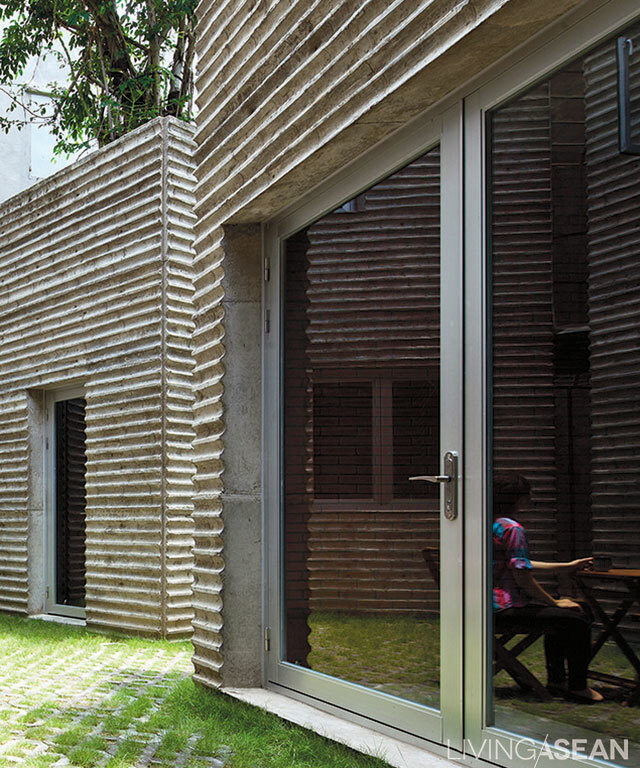 An interesting exterior surface is created by bamboo pressed on concrete walls with a technique relying on the skills of bamboo artisans. Not only bearing the entire weight of each box-shaped building, the walls also support heavily water-absorbent rooftop soil. Normal topsoil is only 30 centimeters deep, but this extra-thick earth is 1 meter deep, more suitable for a large standing tree. The design was developed in consideration of Ho Chi Minh City’s typical flooding. 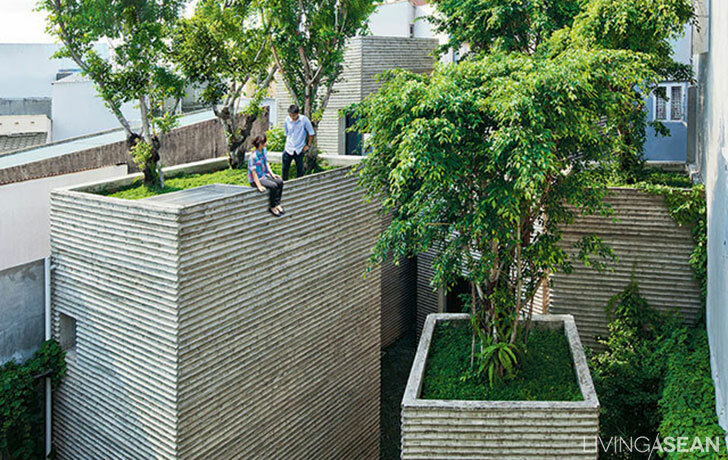 As expected, the tree boxes have been successful in cheering up the depressive father, and even more, this architectural design uses nature to the benefit of both people and nature itself, helping them to live together in harmony.